Jimmy Cricket is going to appear on BBC Northern Ireland’s popular current affairs television show Nolan Live on Wednesday, June 3. 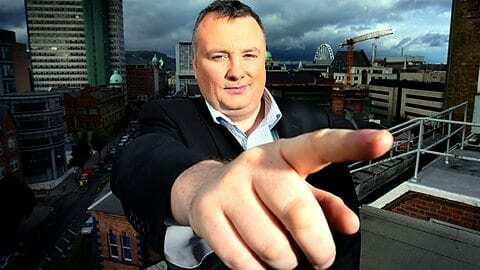 It is presented by Stephen Nolan (above) – a name that might be familiar to readers as he is often heard on BBC Radio 5 live presenting the station’s evening programme at the weekend. Stephen’s TV show in Northern Ireland is a mix between topical debate and chat – he holds a panel discussion during one part of the programme, with the other section devoted to talking to a special guest. The first programme in this current series featured Peter Stringfellow, the British businessman and nightclub owner. Nolan Live has built a significant share of the viewing audience over several series and is now one of the most popular shows that BBC Northern Ireland produces for its home audience.